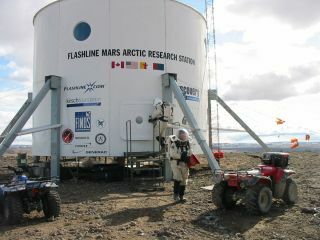 The Mars Society's Flashline Mars Arctic Research Station is situated on Devon Island in the Canadian arctic at 75 degrees north latitude, roughly 900 miles (1,450 kilometers) from the North Pole. The "Journey to Mars" being carried out by NASA and other organizations from around the world is just that — a journey. We started our journey to Mars on Earth on June 22, and, after being delayed due to weather and ground conditions, we finally reached our outpost this past weekend. After staging in Yellowknife, a city of nearly 20,000 in the Northwest Territories of Canada, for a few days, we made our way to Resolute Bay on Cornwallis Island in Nunavut. Resolute is an Inuit community that serves as a staging area for many expeditions of exploration and science throughout the Canadian arctic. It is here that we found ourselves waiting for nearly three weeks, due mostly to the chaotic weather of the north and waiting for enough snow to melt that we could land. Even in waiting, our mission had started. The goal of Mars 160 is to accomplish something different: Send two nearly identical crews to two nearly identical Mars habitats in two different Mars analog environments on Earth, and then compare the scientific return of both halves of the mission while preserving an isolated environment during each mission. It is with this goal in mind that we began our journey on June 22 as the crew of Mars 160 converged at Yellowknife from around the world. A crewed mission to Mars could be compared to the inner workings of a clock, where each spinning gear represents a task or a condition that must meet with a multitude of others in order for the mission to progress. Each of our stops in Yellowknife and then Resolute represented the pre-launch and launch phases of the mission. Most of our gear had been delivered weeks or months prior to our arrival, and it was our job on arrival to each of these destinations to check and cross-check that gear, making sure that we were well equipped for our two-month mission to the Flashline Mars Arctic Research Station (FMARS). Crewmembers of the Mars 160 mission at Flashline Mars Arctic Research Station, on Devon Island in the Canadian Arctic, in July 2017. After biding our time in Resolute for just shy of three weeks, we finally had an opportunity to land. Our Mars lander was a propeller-driven Twin Otter aircraft, a mainstay of arctic transportation. We landed on two separate flights and, as would be expected of a Mars crew returning to a previously established base, we set ourselves to work to bring FMARS back online. The tasks are what one might expect of a structure that saw its last occupants four years before, including thoroughly cleaning every surface. As much as humans pride themselves on good hygiene, we serve as carriers for a multitude of bacteria and spores that will almost certainly travel with us to Mars. Research stations of any kind on Mars will likely face the same battle against dust and mold that we encountered, so our cleaning lesson is one to pass along to Martian astronauts who follow us. As I'm writing this, we have nearly completed bringing the station back into full operation. Once all systems are operational, we will enter into our simulation. To enter into "Sim," as we call it, means that all field science activities to be carried out through the rest of our stay must be done in spacesuits. We entered into our simulation on July 20 — a fitting date considering it is the anniversary of the Apollo 11 and Viking 1 landings. Waxing philosophical from weeks of waiting to travel to FMARS, I've been thinking of the difference between our mission and simulation. Our mission began long before we landed in Yellowknife and started rounding up the rest of the gear we needed to survive Mars on Earth. But even in our time in Canada, we have continued to bond as a crew in addition to carrying out many of the studies and research related to our mission goals. Any mission to Mars will begin when the crewmembers are selected and begin their training together, and it won't end until they depart their spacecraft when they return to Earth. Though our simulation did not start as soon as we had hoped, the delays have taught us valuable lessons that can be applied to future missions to Mars that face similar weather-related delays. But now that we have entered into simulation, our mission has entered its prime. It's good to be on Mars! Editor's note: To follow The Mars Society's Mars 160 mission and see daily photos and updates, visit the mission's website here: http://mars160.marssociety.org/. You can also follow the mission on Twitter @MDRSUpdates. Paul Knightly is a geologist and PhD student at the Arkansas Center for Space and Planetary Sciences at the University of Arkansas in Fayetteville. He is a member of The Mars Society's Mars 160 Twin Desert-Arctic Analog simulation, where he is conducting geological field research to better understand the arctic environment and its implications for Mars. Follow The Mars Society on Twitter at @TheMarsSociety and on Facebook. Original article on Space.com.